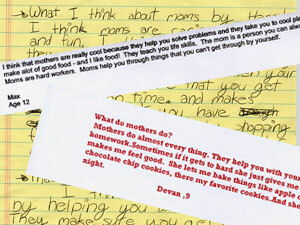 Mothers are the mighty engine behind the human workforce that fuels the economy. They are the nucleus of our society’s integrity. 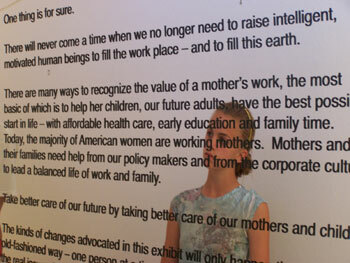 This exhibit, quite likely the first of its kind, puts the distinct work of mothers into a tangible form, showing the economic and social value of her work by recognizing the direct connection between her daily labor while raising her child from infancy, and that child’s productivity as an adult in the work force and in society. In economic terms, she is the producer of “human capital”. Placing a clear and direct assessment of value on the specific work of mothers, the exhibit reveals the apparent economic devaluation and lack of social respect of mother’s work in the United States. Unlike other economically evolved nations with policies governing such areas as paid maternity leave, universal health care and preschool, the United States is truly the laggard in helping its mothers, those who bear most of the burden of rearing the adults of tomorrow who will ultimately support our economy and the propagation of our culture. The exhibit serves as a wake up call for all of us. For our policy makers, however, it is to recognize and give economic remuneration to our nations primary caregivers, and ultimately, the family structure as a whole. The quality of the day to day labor, both of employment and of care giving, can then benefit the very people whom the nation will rely on tomorrow…today’s children. Needless to say, the far-reaching ramifications of supporting mothers and the work they perform, does not stop at economic productivity. That is simply a starting point that is most recognizable in the American culture. It is the good citizen as well whom we all hope to encounter in the next generation and generations thereafter. In essence, the exhibit is as much about children as it is about the mothers who raise them. The exhibit will consist of a short film, sculpture, photography, domestic artifacts, original writings and integrated art forms portraying the day-to-day life of the mother and her intricate relationship with her child, conveying the passion, intelligence and intuition that go into this, the world’s most important job. The job of ultimately raising a child to maturity physically, mentally, and emotionally, prepared to enter into society as a productive worker and citizen. The driving force behind the exhibit is in the form of quotations and statistics. 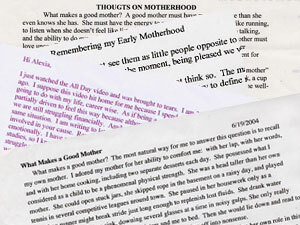 Quotes from scholars in economics, child development and related fields, coupled with related economic statistics of the US presents a clear voice: within this format the viewer quickly comes to realize that the powerful and intense job known simply as “mother” is consistently devalued in both the economic and social arenas and that the call for a shift in our thinking and in our actions is urgent work. “This exhibit is proudly dedicated to those of highly evolved skill, of enormous self-discipline, of fierce love, of humbling compassion and of great, great honor – Mothers. Your Mother. Your child’s Mother. A Mother wherever you may find her...you." Front Entry Area: Has a large blow up (5 ft x 6 ft.) of a black and white photo entitled “Mother” by photographer Lee Nye of Missoula, Mt. 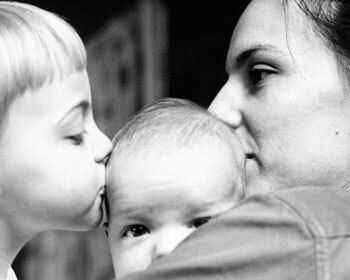 This poignant photo is a close-up profile of a mother’s face as she kisses her infant’s head, while a sibling, following her mother’s example, is kissing the baby from the other side. From the Beginning is a brief historical overview of how the economic value of mothers’ work got left behind in post-industrial America. And yet, the importance of her domestic and maternal work - unrewarded and unsupported - remained the basis upon which capitalism thrived. 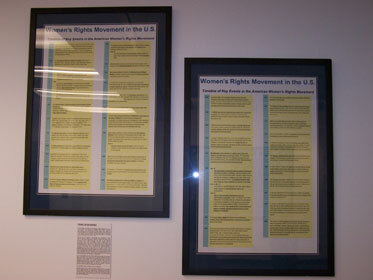 The frame for this piece is carefully laminated with reproduced portions of documents relating the political strides of women through the years. Also included are excerpts of writings relating the then-and-now struggle to gain political recognition for their work for producing the next generation of capitalists - something they have accomplished so well. 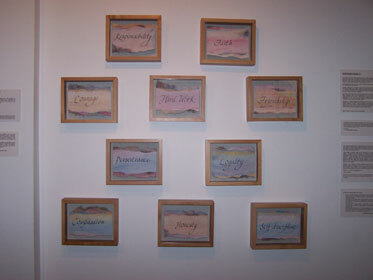 The Virtue Boxes (10 total) inspire the viewer to consider the value of virtue -something that is often instilled at a Mother’s side - with regard to human capabilities, and portrayed here by each virtue written in calligraphy on artistically reworked paper and “floating” in a linen lined oak wood box (8x10x3 inches). The boxes are then wall mounted. This area of such rare artifacts is cordoned off with red velvet ropes, lending the effect of being invaluable and irreplaceable. An alternate powerful version of these boxes will be 3 x 3 x 2 ft. and stacked. They can also be dispersed throughout the exhibit. In Black and White is photography comparing sixteen jobs mothers perform daily (cook, housekeeper, chauffeur, etc.) that are economically unrewarded and unrespected when performed domestically but are accorded monetary and social value in the marketplace, once again asking the viewer - “Isn’t ‘mother’ a job?” The market value of each job is listed as well. Items used to execute these jobs are found all together inside a large Plexiglas box and represent the unrecognized and unrewarded labor expected of one group of people– mothers. Items include: vacuum cleaner, board games, car keys, broom and mop, pots and pans, toothbrushes, crayons and much, much more. A) Sacrifices incumbent upon women during the child rearing years. This might include anything from career pursuits, to respect, to simply enjoying an hour alone. C) Being the primary caregiver of a child in the absence of the birth mother. Tools of the Trade These artifacts, both of mothers and of children, speak of the natural integration of the mother/child relationship. They also represent a mother’s tool box: love, care, intuition, guidance, discipline, compassion and sacrifice. For example, a child’s worn pair of sneakers speaks of the life of a child and of the mother who no doubt taught that child how to walk and how to tie his/her shoes, just as the classic toys of boys and girls suggests the growth stages of the child during a mothers tenure. Other items include: children’s artwork, a careworn kitchen towel, and a lost tooth. Each piece will be framed, wall mounted and displayed individually with brief economic statistics or quotations on a placard next to it. Some placards are the small white classic style like those found next to the work of a master artist, such as Degas, informing the viewer as to that particular piece of work and its significance. Other placards are larger with larger font and accompany the artifact on a shared palette. These exalted items, after all, represent the intangible tools of the trade used by mothers everywhere. a lock of hair, a baby spoon. Sculptures designed by local artists or as a collective effort by students from one of the local art institutions require only one parameter with regard to design: it must include items from the day-to-day life of mothers and children and make some kind of “statement” about the work mothers do. 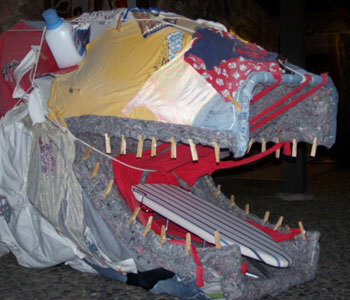 The initial sculpture for the premier of the exhibit, entitled, “The Laundry Monster”, is dinosaur-like in design and scale (10X24 ft.), and is made solely out of laundry related items such as parts of a washer/dryer, lint, clothing and of course, detergent containers. The sculpture base originates out of the top opening of a laundry machine. A petrified red tee-shirt flows out of the mouth w/ a mini ironing board as the tongue and “foaming at the mouth” is created by bubble wrap. The placard reveals the approximate calculation for the labor required for the washing, drying, folding and distribution of laundry for a family of two, three and four during a mother’s tenure. How do we value human time? 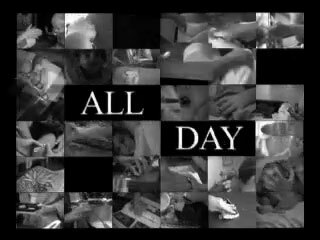 All Day is a 17 minute b/w film of mother’s hands seen in over three hundred varied 1-3 second images, streaming together in a continuous myriad of gestures and sounds we all call “mothering.” Jam-packed, fast-paced, with an eclectic sound bed, it requires rapid gearshifts in one’s emotions and sense of timing just to watch it, not unlike life for the majority of mothers everywhere. Narrated by children, the economic statistics and compelling quotes reveal the true depth of this film in this era of full-time working parents and single working moms struggling to balance “being there” for kids. This section states the policies of several of our sister nations that have made hand-in-hand care of their mothers and children a national priority. Among the areas presented will be: paid maternity leave, public preschools, universal health care, government subsidies and the familial attitude of the corporate sector. Family issues surrounding divorce will also be highlighted. This information will be simply stated, enlarged, and framed (6x4 ft). Tear sheets with this information will be available as well. Take A Good, Long Look is a large, mirrored plastic pane (6x4 ft) with the conclusion of the exhibit printed in the center, allowing the viewer to see him/herself peripherally while reading. The message is a call to action to start the process of change–a process that begins at home and must be delivered by citizens to their legislators. 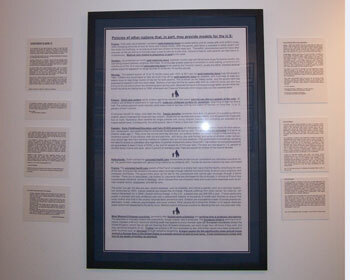 Literature from organizations supporting mothers and/or related domestic issues, as well as a suggested reading list, will be available at a seating area of the exhibit exit. Renewable Resource: A part of the Exhibit Exit Area, this area informs the viewer of ways to better understand the social and political issues surrounding mothers at the legislative level, in the corporate culture and in society at large by providing resource information. Signage in this area invites visitors to suggest what we can do, independently or collectively, to encourage the support of the great, great potential our nation has in her conscientious mothers; two suggestion boxes will be available - one in the form of a reworked laundry basket art piece, along with paper and pens, and the other will be computers set up as an electronic suggestion boxes. Personal passion comes from Alexia’s experience as an educated mother of three, as well as from her upbringing with her two older sisters in a single-parent family headed by her mother who came to the United States from Athens, Greece on a Fulbright Scholarship in the 1950’s. Her mother who raised the three girls alone after the father abandoned the family with no financial support, went on to complete her Masters and PhD, later becoming a university professor and published poet. After completing her BA in English at the State University of NY at Fredonia, Alexia had a successful career in the garment industry in New York City for eight years while pursuing the use of her communication skills through entertainment, writing, and visual art. She is a contributor in Life Messages for Moms, an inspirational book on motherhood by best selling author, Josephine Carlton. Alexia resides with her husband and three children in northern California. A complete source compilation and list of acknowledgements are available upon request.